Well here are the results of the inaugural Mosaic Music. 5 entries is 4 more than I was expecting, so its a good start in terms of numbers, and a few folk have said they will try to do it in March. Anyway, below is the soundcloud player thing that I’ve put together. Thanks to Pablo, Michael, Olly, Casey and Hugo. 1. DJ Full Moon “Lacan” – So, this is from DJ Full Moon (aka Pablo and Michael) and is named after the French psychoanalyst Jacques Lacan and although the lyrics are not directly from any of his writings “baby won’t you lay down on the chaise longue” are words I hope Lacan would have said more than once. 3. Craig Coulthard “A Generous Joy” – I apologise, mine’s is over 1 minute long, but they are only guidelines after all…the lyrics to this come from 2 seperate poems (in the same book) by Sorley Maclean. 4. Honeyfuzz “The Couriers” – This comes from Casey, just before midnight on the last day of February. The lyrics come from a book of poems called “Ariel” by Sylvia Plath. 5. Hugo de Verteuil “Moderato Cantabile” – Hugo has gone all analog and recorded his originally on 4 track. The lyrics (moderato cantabile) are the title of a novel by Marguerite Duras. It was also made into a film (see below). I hope you enjoy these tracks, and please do send something in next time – I’ll be putting up a video of the March draw soon. Just for your own interest, here’s a couple of video’s related to some of the lyrical content for the above tracks. Cheers! This is brilliant for a number of reasons, not least the music. If you want subtitles, you can get them by clicking “cc” on the bottom of each player. 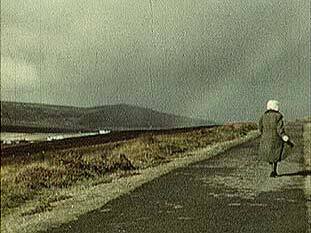 Two short portrait films by the Scottish poet and film-maker Margaret Tait. I can’t embed this unfortunately, but follow this link to watch it on youtube. Ok, this is not a review. I have a few posts I want to write about artists films, and while I was thinking about this, I happened to be in Glasgow all day yesterday and saw this show at the CCA. I thought I had never heard of Harun Farocki, but I had read about him and seen a couple of his films before. There are three main films showing, all of them are great, particularly “Immersion” (2009) which documents a rather frightening form of psychological therapy for American soldiers suffering from post-traumatic stress. If you get the opportunity, please go see this show, its on until the 3rd of March. As usual, it’s quite difficult to see any of his films online (even on his own website) and there are few of any real quality on youtube etc, anyway in the meantime, here are a couple. The second in particular is of relevance at the moment, as it reflects on television/camera coverage of the revolution in Romania as it happened after the fall of Caucescu – it is an incredible film. This are all from Doune Castle, where Monty Python filmed some of The Holy Grail. The weekend past I spent 2 nights in a wigwam/tipi near Comrie with some good friends. Funtimes. Marshmallow magic. Castles. Curry. Stove toasties. Here’s part 1 of some photos to prove it was real. just a reminder for you to send me your tracks by the end of February. I have received one finished track already and it is worryingly good…. So any other suggestions would be welcomed….. Here is the final part of “Off Kilter” – this time Jonathan travels around the “stadiums” of some of Scotland’s smaller football teams (and a visit to the pineapple building). If you have enjoyed watching these, please go and watch more of Meades’ work, Magnetic North, Further Abroad, Abroad Again, Jerry Building, Joe Building – they are all brilliant in their own ways. You are currently viewing the archives for February, 2011 at The Curse & The Cure.